When it comes to throwing a 30th birthday celebration that won't be forgotten, there is going to be hard work and planning involved. There are many things that need to be taken into consideration when throwing a 30th birthday party for someone that you love. Whether you need to figure out a menu, find 30th birthday gag gifts, nostalgic candy, or 30th birthday candy gift baskets, getting the ball rolling is going to mean having an outline and a game plan ready to go. The first step when setting up a 30th birthday celebration is to set a date. Figure out which date is going to work for the guest of honor, without actually giving up the surprise. It might be helpful to work with a close relative of the guest of honor, so that you can get a better idea of what the official date should be. Plus, your partner in crime can help keep that date open along the way. Location is another important planning point when setting up a 30th birthday celebration. You will first want to figure out who will be invited. Once you get a solid idea of how many people will be attending, you can then figure out which location will work best. Whether you choose to rent a hall, host at someone's house or a hotel, it's all about making sure you have enough room to accommodate all of your guests. Create the scene and build a theme for your party. The idea behind a 30th birthday celebration is to have fun and celebrate such a big milestone. Themed parties are not only fun but they allow you to build ideas. 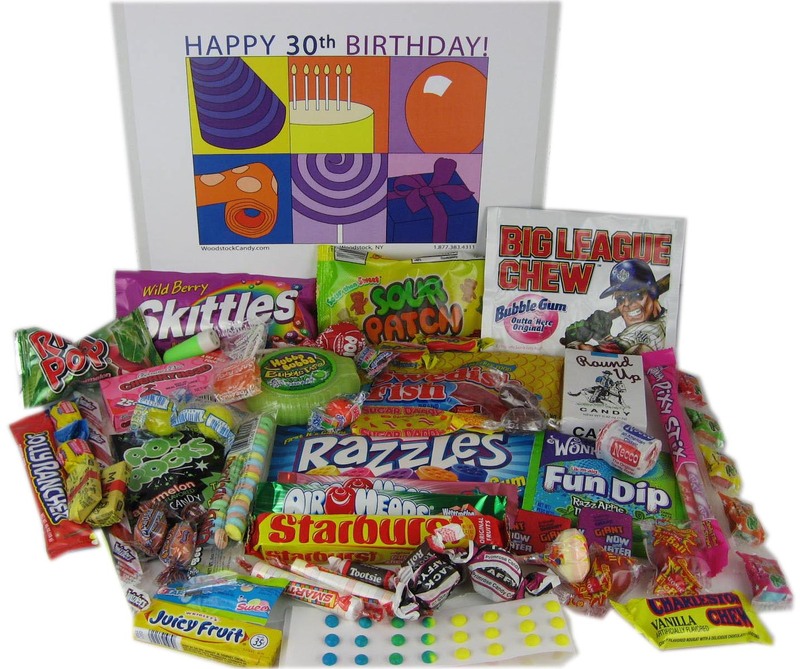 You can include fun and exciting nostalgic candy ideas, and 30th birthday gag gifts based solely around your theme. Will you want to include birthday party games? If you want to get everyone's attention then games may just bring spark and excitement. Plus you can easily reward your guests with 30th birthday candy gift baskets, for their participation. However you wish to put together your special 30th birthday celebration, it's all about making the guest of honor happy. Embracing the special moment with friends and family are the ingredients to a successful celebration. Everyone is looking for something different to give people they love. It is especially difficult to find the right gift when they are over fifty. The baby boomers are a large group of people and this group is getting bigger every day. Most of these people have everything they need. They don’t want another vase or set of cufflinks. If they need something, they usually have the money to buy it. This makes birthdays and Christmas hard, because most people have no idea what to give them. There is something that will bring a smile to most faces. Nostalgic candy is something that tastes just as good as it did thirty years ago and at the same it time brings back wonderful memories. Most people remember Necco Waffers or those silly wax lips. Boston Baked beans were always a hit, but candy cigarettes were usually everyone’s favorites. Saturday afternoon kids got their allowance and headed toward the corner market. They filled their pockets with tootsie rolls, candy lipsticks, chick-o-sticks and a big box of Good and Plenty’s. The best part is that after buying all the candy they could eat at the afternoon matinee, they still had money left. These memories are a lot of fun for everyone. 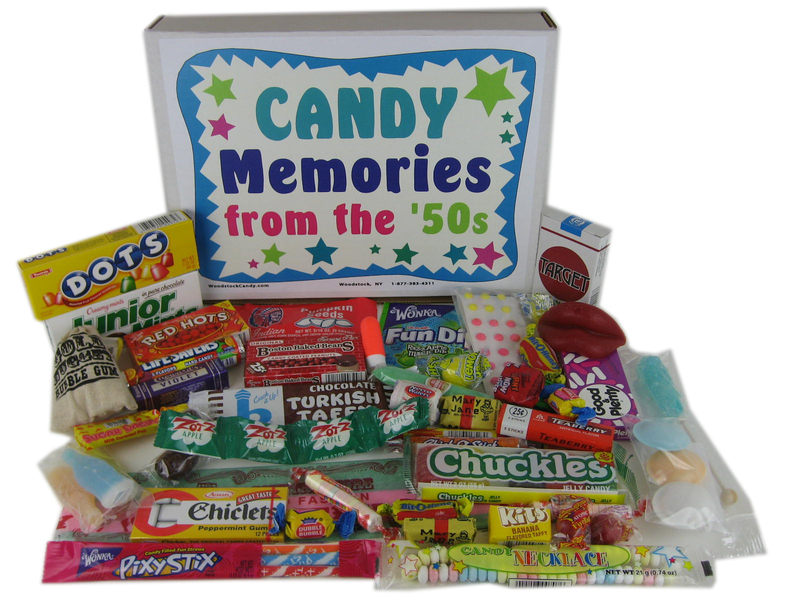 Nostalgic candy gift baskets are always a big hit with people of all ages. Younger people remember hearing stories from parents about all the great candy they loved as children. These nostalgic candy gift boxes are a great way to let everyone enjoy a taste of the past. The candy can be found in several different places. Most people like to put it together in a great gift box or basket. That way there is plenty of candy for everyone to taste. Most people can’t stop smiling when they see the candy. It really is a wonderful choice for anyone who has a sweet tooth. Anyone who wants to buy a gift that will bring smiles should consider nostalgic candy. Have it sent right to their home as a surprise or put it under the tree. It will be a welcomed gift. So, have some fun and consider this unique gift for those who are a little picky and can be a little difficult to buy for. It is guaranteed to be a hit so don’t forget to pick up some to enjoy. Those old candies are not only fun to look at, but they taste great! Older people remember the candy they used to love as children. Often they would ride their bike to the corner store to get some wax lips or Boston baked beans. A box of Boston baked beans could last all afternoon. Wax lips could be worn to make the other kids smile and then chewed for the rest of the afternoon. It was a wonderful time and many people have memories of these great treats. Retro candy is a wonder gift for people who are past forty. 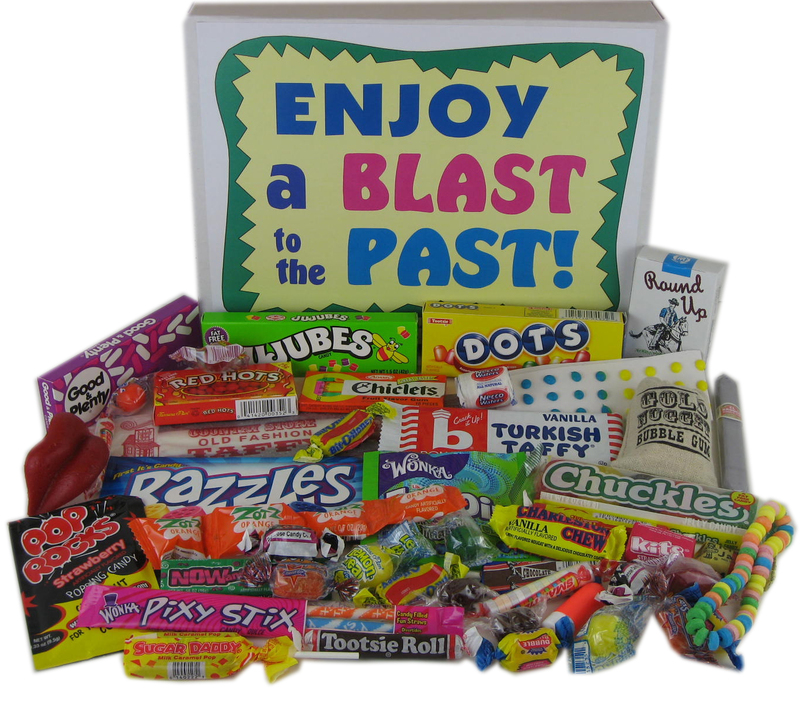 Of course anyone would love to get a nostalgic candy gift basket because the younger generation has heard stories about things like Now and Laters Candy. They remember Mom and Dad talking about going to the movies on a Saturday afternoon and all the candy they would stuff their pockets with. Most stores no longer carry candy like Bit-o-Honey. They are long forgotten, but as soon as someone sees a Bit-o-Honey, they light up. Those were the days. Anyone who wants to make someone smile should consider giving some nostalgic candy. Of course holidays and birthdays are the perfect reason to give these gifts, but anytime of the year can be special with some candy that brings back memories of days gone by. 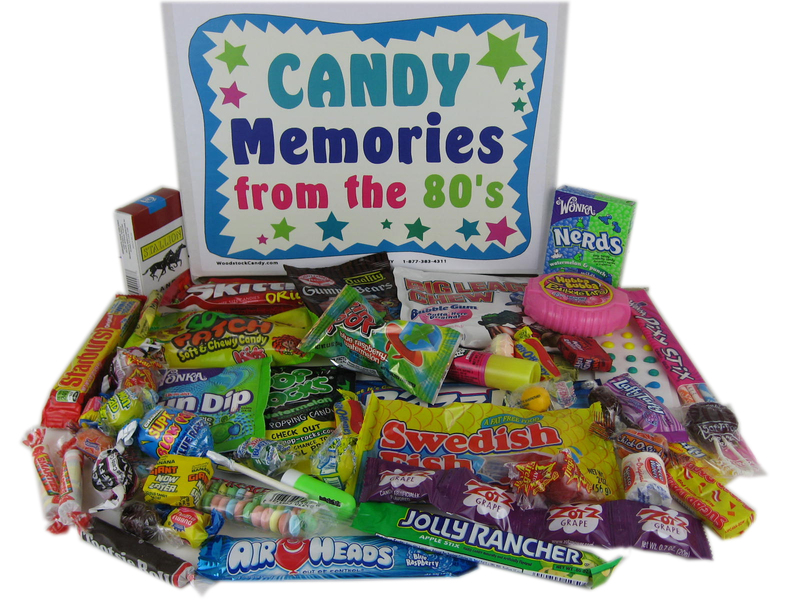 Nostalgic candy gift baskets are one of the best ways to put a memory package together. They are a lot of fun for the person who receives the basket and everyone can get a chance to enjoy some of the old time favorites. Times have changed, but most people still remember the good old days. If someone is looking for the perfect gift that will bring a smile to someone’s face, they should look into nostalgic candy. Don't forget to put in a pair of wax lips. In fact, buy a pair for everyone at the birthday party. It will bring a lot of smiles and everyone can chew on their wax while enjoying the celebration. As the holiday season approaches, there are a lot of things on everyone's minds. Some people are excited to see family that they may not have seen in a while. Some people may be excited for holiday music filling the air. Some people may be excited for the weather that usually accompanies this time of year. The majority of us, among all of these other things, are thinking about the gifts that they want to buy for the people that are important in their life this holiday season. One of the first things that come to mind when shopping for a gift for another person is that you would like to buy them a unique gift. It can often be difficult to think of something that you think the important person in your life will really like and is also unique. Something that is almost universally liked is candy. Not only is candy delicious, but it can often bring back happy memories from when you were young and eating the same type of candy. This is where retro candy comes in! 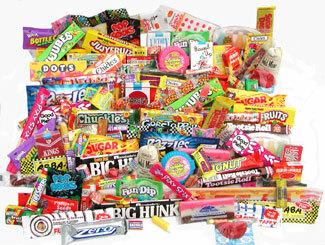 We offer great retro candy gift baskets and retro candy boxes that the important person in your life is sure to love! One of the really great things about these baskets and boxes is the wide variety of candies included. The candies that are included in these nostalgic candy baskets and/or boxes are Giant Taffy, Root Beer Barrels, Smarties, Tootsie Rolls, Saf-T-Pop, Dots, Jujubes, Good & Plenty, Razzles, Wax Lips, Zotz, Candy Buttons on Paper, Gold Mine Bubble Gum, Red Hots, Lemonheads, Gobstoppers, Mary Janes, mini Necco Wafers, Black Taffy, Now & Later, Bonomos Turkish Taffy, Boston Baked Beans, Pop Rocks, Fun Dip, Atomic Fireballs, Sweetarts, Bit-O-Honey, Chiclets, Pixy Stix, Candy Necklace, Candy Cigarettes, Candy Lipstick, Chick-O-Stick, mini Charleston Chew, Coconut Long Boy, Dubble Bubble Gum, Sugar Daddy Jr., Zotz, Bubble Gum Cigar, and Chuckles. 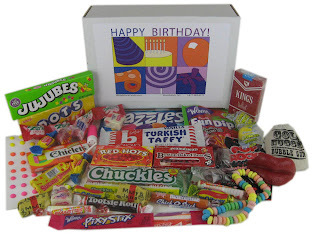 That special person in your life is sure to have a special connection with at least one of these many candies that is included in the basket or box that you plan to order. Not only are these boxes and baskets great for the holidays, but they can also be bought for other occasions as well. They are great for birthdays, anniversaries, and any other occasion in which you feel that a gift is appropriate. Celebrate these special occasions with retro candy to make your special time even greater! People love to remember those days way back when they were just young children full of energy and had an endless amount of happiness flowing through their bodies. Surely when they think back of all the things that brought a smile to their face, on the list if not on the very top would likely be candy, but not just any candy, classic candy! Now looking back today, a more appropriate name would be retro candy. Retro candy is that nostalgic candy from childhood, especially candy that made its name in the 50's and 60's. Essentially, eating candy like this will bring back those fuzzy warm types of feelings from most people’s past. It is truly happiness you can taste. To experience such good feelings again would be worth their while to indulge in their own retro candy boxes. Having these readily available will always give people the opportunity to take a trip down memory lane. Those who do will likely think of those childhood visits to the movie theater on weekends with their friends, when they would share the excitement of picking out their favorite candy. Now they can relive moments like that with every bite. Many people may not remember the last time they purchased a Good and Plenty or Red Hots, Bit-O- Honey, Mary Janes, and even Lemonheads just to name a few. But you can bet they remember the first time they ate one of each. As most are probably aware, these are a staple of the 50's. While, not everyone may have grown up in the 50's, a lot of people’s parents did. This gives them a chance to share a taste of happiness with them. They will have the same types of memories. All adults have a fond memory of being young and eating their favorite types of candy. The retro candy gift baskets would be a perfect chance to share that experience together. Anyone who grew up in the 60's would more than likely begin to smile while thinking back of the treats they used to enjoy. Treats such as Candy Buttons on Paper, Jujubes, Charleston Chew, Candy Cigarettes, Fun Dip, and of course the famous Tootsie Roll! These brands of candy have lasted throughout all these years. New candy comes and goes, but the memories we share last a lifetime. That keeps this candy alive forever in our hearts and will continue to provide us with happiness you can taste. Isn’t it wonderful how eating favorite candies from your childhood can bring back a rush of warm memories? Whether you’re a child of the 1960s, 70s, 80s, or somewhere before or after, almost everyone agrees that the taste of nostalgic candy can be a delightful way to recall the past. The memories may be of standing in line at the grocery store with your mom, asking if you could have a Bit-O-Honey bar. Remember the honey flavored taffy goodness of those? Or if you were into chewy candy, perhaps you enjoyed the fruit flavors of Now and Laters candy or the peanut butter chewiness of Mary Janes. You might even have fun memories of sitting on the floor with your sister or brother, a Halloween bag of goodies between you, swapping Now and Laters for a pair of Wax Lips. Whether you thought they were tasty or not, Wax Lips were always good for a laugh! Or maybe your grandpa kept a candy jar in his study filled with treats like Boston Baked Beans. Something about crunching into one of those old-fashioned candy coated peanuts might just bring back the sound of your grandfather’s laugh or that comfy chair in his study where you curled up with a good book. You probably still recall the way the reddish brown candy coating of the Boston Baked Beans would melt in your hand. Something about food has the ability to bring back vivid memories. Nostalgic candy can make great wedding reception favors. 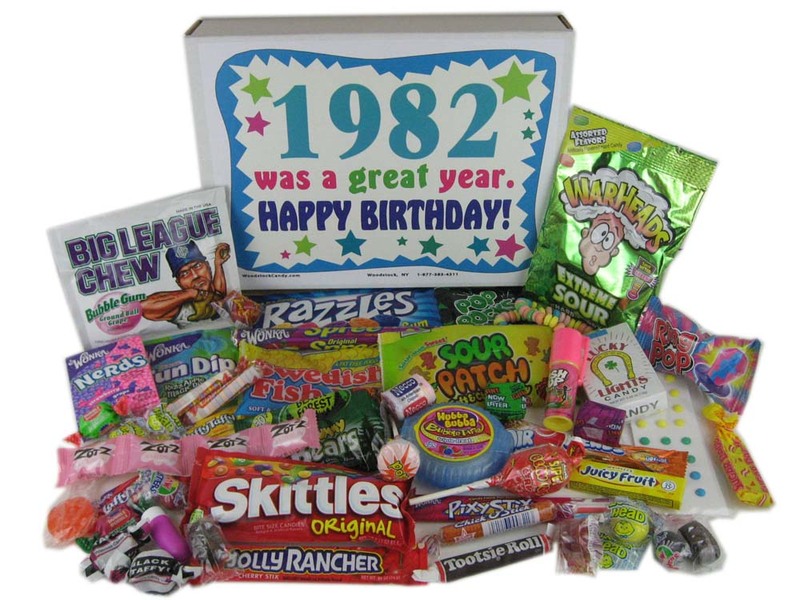 Nostalgic candy gift baskets, filled with favorites from your childhood, can also make a great gift on a special birthday or be a fun inclusion at a family reunion. It’s almost guaranteed to be a story starter! When one nears their 60th birthday celebration, family and friends typically aim to make the celebration as memorable as possible. After all, one only gets to celebrate this occasion once in their lifetime! However, it can be quite difficult for those planning the celebration to make it the exciting and fun celebration that everyone would most enjoy. One of the biggest challenges, is coming up with interesting gift ideas that will be well-suited to one's 60th birthday. Many people scratch their heads at this point, completely unsure of what would be best on this particular occasion. If one is celebrating their 60th birthday, then what would be best suited to the occasion? Nostalgic candy may be the answer! It's a wonderful surprise to see 60th birthday gag gifts such as nostalgic candy sitting on the table. These 60th birthday candy gift basket gifts will brighten up the day for everyone involved. Filled with candy from the yesteryear, reminisce about the days of old with this vintage candy. Not only is it an interesting gift, but it can bring back wonderful memories and help make one's 60th birthday a day that they won't soon forget. Filled to the brim with yummy candy, these 60th birthday candy gift basket gifts can be used to liven up the celebration. 60th birthday gag gifts are always a great idea, and most people love candy! What a treat it is for the celebration and all involved. Sweet candy from the past to bring back one's nostalgia is the answer to what could otherwise just feel like another humdrum birthday. When we think of nostalgic things, a lot of the time the things that come to your mind is music, clothing, television programs and even certain places we went to. Well that is all fine and good but let's take it back to nostalgic candy! Yes candy! For us older folks, when we were younger, there was such a thing as penny candy. Back in the day we would go into the corner store with $1 and come out with enough candy to last us all day. If you were a good candy shopper, the candy could last you into the next day. Don't you remember shaking that box of Boston Baked Beans and hardly being able to wait to open them and turn that box up to your mouth? We ladies can remember the red wax lips and the candy lipsticks that we would buy and because were too young to wear actual lipstick, we would put on the wax lips prancing around pretending we had on lipstick. We didn't prance long because we could not wait to eat the wax lips! We loved pretending with the candy necklaces and bracelets as well. How grown up did we think we were when we had the candy cigarettes? Remember eating Sugar Daddy suckers, Tootsie Rolls, Bit-o-Honey and Now and Laters candy and getting them stuck to your teeth and the roof of your mouth? How about taking an entire package of pop rocks and putting them in your mouth and feeling them pop and fizz in your mouth. We think about all of the candies we enjoyed when we were young like Mary Janes, Fun Dips, Smarties, Pixy Stixs, Red Hots and so many, many more and it brings a smile to our faces. But what we don't seem to realize is that although it may have been years since we last enjoyed these candies most of them are still around. These great candies are now being enjoyed by our children and our grandchildren. So, the next time you get nostalgic thinking about all those yummy candies of your childhood, search around and treat yourself and a few of your good friends to nostalgic candy gift baskets; you'll be glad you did. 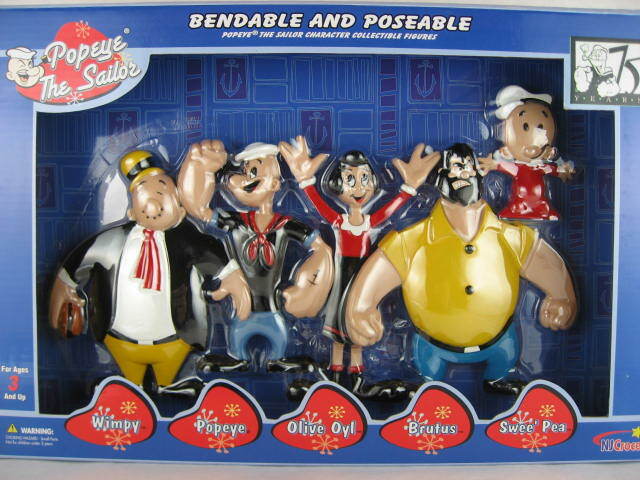 Since the holidays are approaching, many people are looking for a unique gift for that special person. If you are looking for something wonderful to give to a friend, perhaps you should consider personalized nostalgic candy gift baskets. If you are looking to surprise a friend with a great gift, then you should purchase nostalgic candy birthday gift baskets. For the holidays, you may not want to purchase a friend something boring from a department store. Your friends and family deserve something unique that they will use and love. You can’t possibly go wrong with candy, which is a gift that everyone loves. 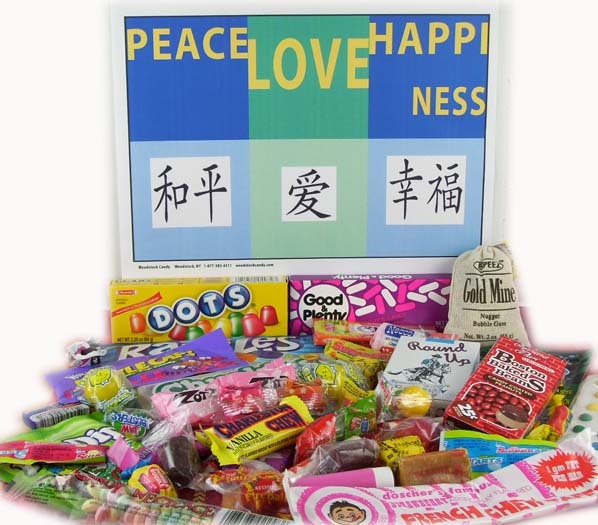 You can personalize your nostalgic candy gift basket, to make it more special for the receiver. A candy gift box can contain a variety of different types of candy, depending on your taste. The best part is you can fill the gift box with candies that you treasured during childhood. For example, suppose your friend loves dots, Mary Janes, or tootsie roll candy. These can be included in the box. Or maybe a friend loves pop rocks or sugar daddies. A box of these would excite them tremendously. These candies will make a great holiday treat, but could also be great for birthdays and other festive occasions. Once you decide to purchase your candies, you can order either on line or by phone. The candies will normally ship to the specified within one to two business days. Once your friends or family receive the special candies, they will enjoy it tremendously.